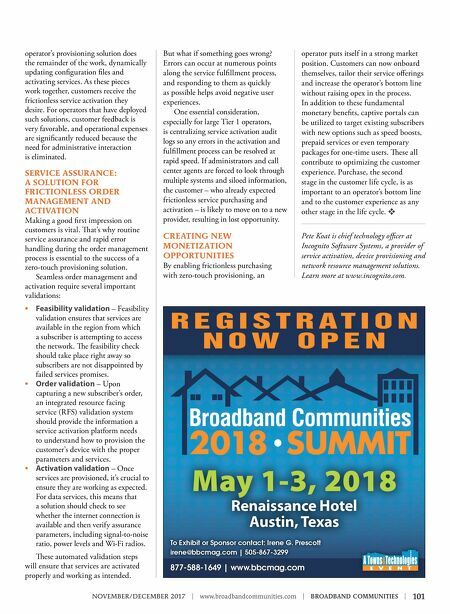 NOVEMBER/DECEMBER 2017 | www.broadbandcommunities.com | BROADBAND COMMUNITIES | 101 operator's provisioning solution does the remainder of the work, dynamically updating configuration files and activating services. As these pieces work together, customers receive the frictionless service activation they desire. For operators that have deployed such solutions, customer feedback is very favorable, and operational expenses are significantly reduced because the need for administrative interaction is eliminated. SERVICE ASSURANCE: A SOLUTION FOR FRICTIONLESS ORDER MANAGEMENT AND ACTIVATION Making a good first impression on customers is vital. at's why routine service assurance and rapid error handling during the order management process is essential to the success of a zero-touch provisioning solution. Seamless order management and activation require several important validations: • Feasibility validation – Feasibility validation ensures that services are available in the region from which a subscriber is attempting to access the network. e feasibility check should take place right away so subscribers are not disappointed by failed services promises. • Order validation – Upon capturing a new subscriber's order, an integrated resource facing service (RFS) validation system should provide the information a service activation platform needs to understand how to provision the customer's device with the proper parameters and services. • Activation validation – Once services are provisioned, it's crucial to ensure they are working as expected. For data services, this means that a solution should check to see whether the internet connection is available and then verify assurance parameters, including signal-to-noise ratio, power levels and Wi-Fi radios. ese automated validation steps will ensure that services are activated properly and working as intended. But what if something goes wrong? Errors can occur at numerous points along the service fulfillment process, and responding to them as quickly as possible helps avoid negative user experiences. One essential consideration, especially for large Tier 1 operators, is centralizing service activation audit logs so any errors in the activation and fulfillment process can be resolved at rapid speed. If administrators and call center agents are forced to look through multiple systems and siloed information, the customer – who already expected frictionless service purchasing and activation – is likely to move on to a new provider, resulting in lost opportunity. CREATING NEW MONETIZATION OPPORTUNITIES By enabling frictionless purchasing with zero-touch provisioning, an operator puts itself in a strong market position. Customers can now onboard themselves, tailor their service offerings and increase the operator's bottom line without raising opex in the process. In addition to these fundamental monetary benefits, captive portals can be utilized to target existing subscribers with new options such as speed boosts, prepaid services or even temporary packages for one-time users. ese all contribute to optimizing the customer experience. 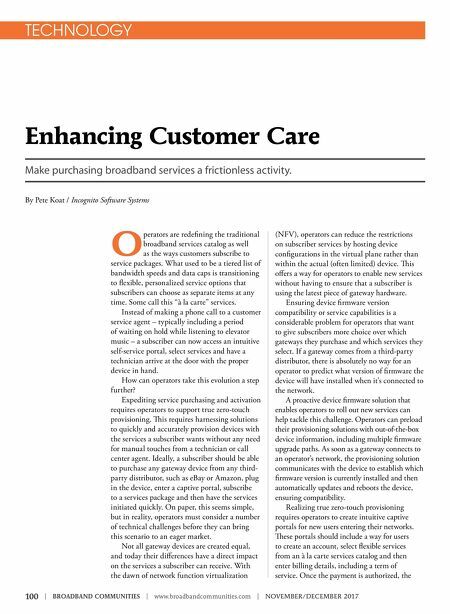 Purchase, the second stage in the customer life cycle, is as important to an operator's bottom line and to the customer experience as any other stage in the life cycle. v Pete Koat is chief technology officer at Incognito Software Systems, a provider of service activation, device provisioning and network resource management solutions. Learn more at www.incognito.com.